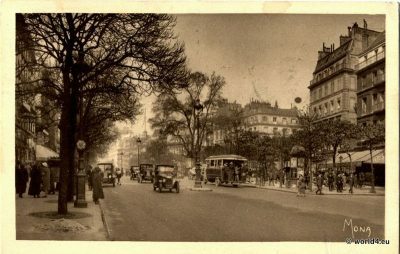 Home » Postcards » The Grand Boulevards Paris 1925. The Grand Boulevards Paris 1925. The Grand Boulevards, Paris 1925. 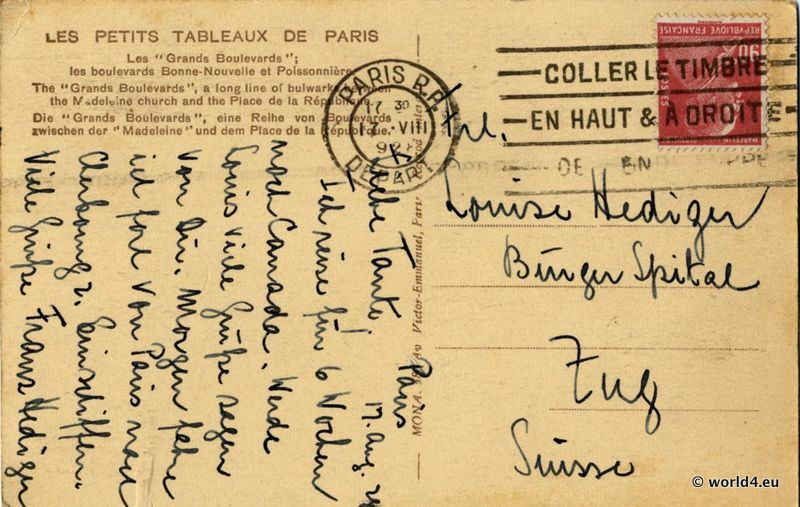 Beautiful picture postcard with old cars, pedestrians, shops and the architecture of the 1920s in Paris. The Grands Boulevards are the oldest boulevards of Paris. Follow the course of the former city wall of Louis XIII. and form today on the north of the Seine Rive Droite located a semi-circular traffic artery between the Place de la Madeleine in the west and the Place de la Bastille in the east. Louis XIV from 1668 ablate the northern Paris city wall, which created under Charles V and under Louis XIII. had been extended to the west. Under the direction of the architect Pierre Bullet to 1705 was called the Nouveau Cours created, a tree-lined avenue between the old city gates Porte Saint-Honoré (now Place de la Madeleine) and the Porte Saint-Antoine at the Bastille. The resulting promenade soon got their name from the north of the Bastille located Bastion Grand boulevart. The French word boulevard designated since the Middle Ages a city wall. The Grands Boulevards developed in the 18th Century entertainment miles with ballrooms, brothels and boulevard theaters. Previous PostVue dènsemble de la Madeleine. 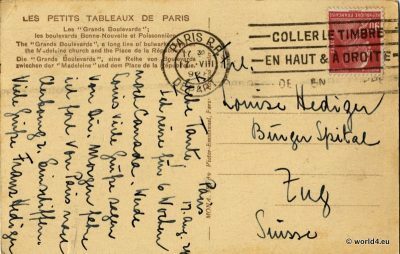 The Madelaine Church in Paris 1925. Next PostOld Farmers tool. Handmade Broom.